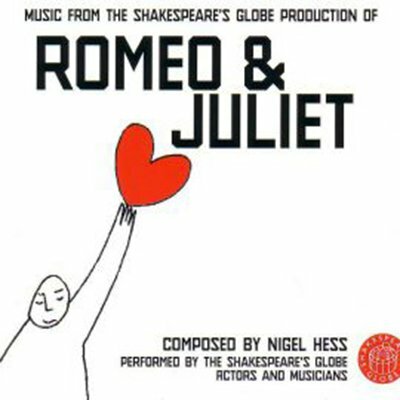 Songs and music from the Shakespeare's Globe 2009 production. "A special mention for the music; a quartet of singers provides commentary on the text with songs beautifully set by Nigel Hess, and the musical accompaniment complements the staging excellently"
"Nigel Hess's music, often used filmically, as in Juliet's imagining her future tomb, was beautiful, especially the close harmony quartet." "There is excellent music, set to 16th-century poems by Nigel Hess." "Nigel Hess, working in tandem with the Globe musicians, has interwoven a fabric of atmospheric sounds and themes throughout the performance. The effect is often haunting and lends a subtle pathos to the play’s more melancholy moments when the daylight drains from the sky and the wooden O seems to warm up in the cool of evening."